Physical characteristics: The southern red bishop is also called the grenadier weaver because of the bright colorings of the male in the breeding season. The adult body length is 4 inches (12.5 centimeters). During the breeding season, the neck, tail and wings of the male become brilliant red-orange, while the breast, underside, and the top of the head and face become a lustrous black. Even the beak changes to black. Out of season, the male's coloring reverts to dull shades of brown. 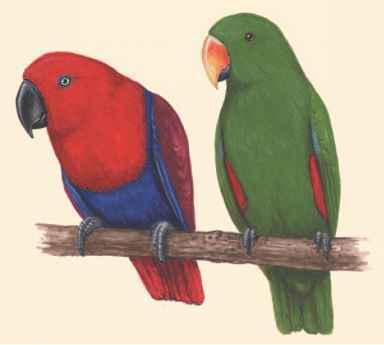 The females look similar to out-of-season males and do not change color during the breeding season. Geographic range: All of Africa south of the Sahara, except part of southwest, and horn of Africa (northeast). Habitat: Grasslands with tall grass, near water sources. Diet: Green or ripe seeds of wild grasses and shrubs, young leaves and flowers, and insects. Behavior and reproduction: The red bishop forages in tall grasses, plucking seeds from grass stalks, often perching on grass stalks to reach the seeds, and on shrub seeds, leaves, flowers and occasional insects. The red bishop is polygynous, one male mating with several females who settle in nests made by the male. At the start of a breeding season, groups of males will settle in one large area, among treetops, each male building one or more nests, then singing and posing to attract females. Oddly enough among weavers, the red bishop is not especially vocal. It will screech if alarmed, and uses a small number of other calls, but nothing drawn out and elaborate as in most other weavers. Red bishops and people: Red bishops can be serious pests, flocks of them descending on grain fields and helping themselves to the seeds. Collias, E. C. "Inheritance of Egg-color Polymorphism in the Village Weaver (Ploceus cucullatus)." Auk 110, no. 4 (1993): 983-692. Keng, Wang Luan. "Nature's Nest Architects at Sungei Buloh." Wetlands 3, no. 1 (1996). Online at http://www.sbwr.org.sg/wetlands/text/ 96-3-1-1.htm (accessed on July 12, 2004). Lahti, David C. "Cactus Fruits May Facilitate Village Weaver (Ploceus cucullatus) Breeding in Atypical Habitat on Hispaniola." The Wilson Bulletin 115, no. 4 (2003): 487-489. Victoria, J. K. "Clutch Characteristics and Egg Discriminative Ability of the African Village Weaverbird, Ploceus cucullatus." Ibis 114 (1972): 367-376. Williams, J. G., and G. S. Keith. "A Contribution to Our Knowledge of the Parasitic Weaver Anomalospiza imberbis." Bulletin of the British Ornithological Club 82 (1962): 141-142. Percy FitzPatrick Institute of African Ornithology: Roberts VII Project. http://web.uct.ac.za/depts/fitzpatrick/docs/listlink.html (accessed on July 12, 2004).